ICPVTR also offers a Counter-Terrorism Leadership Programme, CTLP, for professional attachments. Participants require experience from the following industries: Law enforcement, Intelligence, Military, and any other industry that is related to security services. Participants will be required to attend the counter-terrorism related modules offered in the given trimester of the RSIS Master of Science programme. In addition, they will be required to work at ICPVTR and turn in agreed upon assignments while attached to the Centre. At the end of the 3 months programme, participants who have successfully met the requirements would be awarded a non-credit certificate from the Centre. 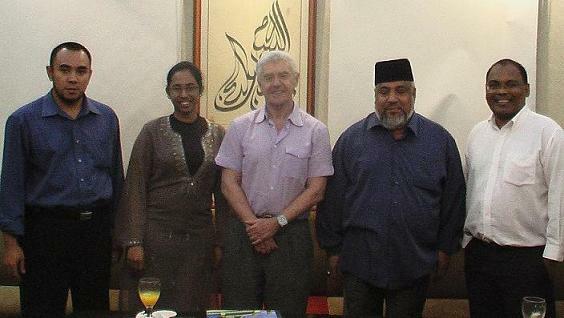 Professor Arie Kruglanski, Distinguished Professor at the University of Maryland and Co-Director of the Department of Homeland Security’s CT Centre, with Ustaz Ali Mohamed, Co-chairman of Religious Rehabilitation Group, Dr Rohan Gunaratna, Jolene Anne Jerard and Ustaz Mohamed Bin Ali at Khadijah Mosque on January 11, 2008.